alien pods as farmers’ almanac, or worse? Blooms in May and looks like this. When the flowers are gone the vine greens up into a thick canopy, keeping the patio cool and shaded and even sit-underable for a while during a gentle rain until the drips finally manage a way through. Ours is either Chinese or Japanese. One variety twines clockwise, the other counter clock. I can’t remember which is what, nor can I remember which way ours turns. Nor do I much care I guess, else I would have figured this out (uh, google maybe?) sometime in the fifteen or so years since we planted the thing. In early summer you get a few seed pods. Two, maybe three. 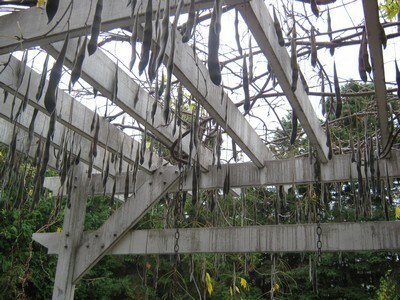 You hardly notice them until autumn when they hang down through the by then de-leafed vines like fat string beans. We’ve never had more than three. And that’s only half the trellis. I must say, en masse they look less like innocuous string beans and more like alien pods with a plan. But may I ask what’s going to happen when these babies start falling? And when exactly will that be? While I’m outside with a cup of tea or sweeping or raking or shaking out a mat? While Peter’s on his way to the barbeque to innocently grill a winter hamburger or plank of salmon? And will it be all at once as an angry battery of hard, pointy pods, each with seven or eight hefty seeds inside that we’d have no chance against—none. Especially if we’re looking up at the time. Or will it be a cruel and strategic one time event…? I mean—Should we get helmets?